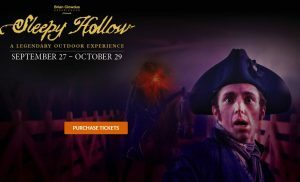 There’s a reason why Sleepy Hollow is about to sell out, even though they extended their season from October into September, making it one of the very earliest Halloween attractions to open this year. It is the most fantastic outdoor Halloween event you will see in New England. The event takes place at Old Sturbridge Village, the historic re-enactment village in central Massachusetts, which has long been my favorite over Plimoth Plantation, Strawbery Banke, and Mystic Village, other living museums where live actors portray people from the past. Come in the daytime and you’ll find a tinsmith, blacksmith, saw mill, farm, potter, and numerous other old timey folk from the 1830s to mingle with and learn from. I recommend arriving early during the daytime and exploring the attraction, which closes at 5pm. Then at 5:30pm you can enter the Sleepy Hollow event where they serve a simple dinner and alcohol. The dinner was inexpensive and adequate but unfortunately we were left to entertain ourselves through the attraction opening at 7pm. I might have preferred something like the Boston Tea Party Museum, which has hosted dinners — with great food — where live actors sing and host conversation at the table all evening. As night fell, and thankfully it was a warm evening, we were let back into the main Old Sturbridge Village grounds, walking a path lit by torches. The grounds are especially beautiful at night. You are far enough from Boston for the sky to be filled with stars. The old timey houses and torches, next to a pond, are magical. Even without a performance, it’s worth visiting just for the quiet stillness. Attendance is limited, so we never got the feeling of being too packed in. So we already were having a great time, and the show hadn’t even begun! Sleepy Hollow takes place in 4 or 5 outdoor venues, and the crowd moves from one location to the next as the show progresses. We were expecting something more spooky, but were pleasantly surprised to find spooky themes but also some singing, dancing, and comedy. It’s a show safe for older children, and for people who aren’t 100% mad about Halloween and would never go to haunted house. The production uses the old time buildings of Old Sturbridge Village as the staging, but adds clever, well designed lighting effects and fog. The story follows the tale of Sleepy Hollow well, unlike the TV show of the same name, so there is literary authenticity there as you might expect. But the show takes risks, and doesn’t allow the prestige of the history to get in the way of naughty innuendo and spooky themes. The Headless Horseman appears, of course. They even engage the audience in joining the party that takes place during the show. Refreshments and snacks are available at kiosks throughout the performance — something that Double Edge Theatre could learn from, my favorite outdoor theatre troupe. The cast blessedly uses microphones, so we had no trouble hearing them. 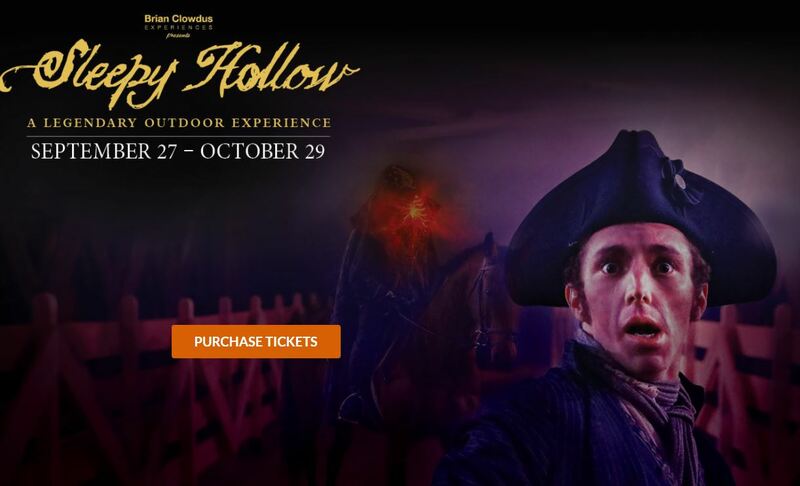 Sleepy Hollow is really an outdoor theater performance, not a Halloween haunted house, but it has sprung into my top five choices for Halloween in New England. With the fantastic setting, a daytime attraction, dinner option, and the great storyline, acting, and staging… Take it from someone who has now reviewed 44 Halloween attractions in New England, which has got to be a record. Sleepy Hollow is beyond a must-see event. If you like Halloween at all, grab the last remaining tickets for this season, and get on the Old Sturbridge Village email list for next year. This is beyond a 5-star attraction, I give it an extremely limited rating of 5 stars plus.